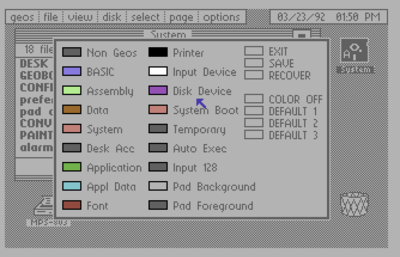 GEOS (Graphic Environment Operating System) was an operating system from Berkeley Softworks (later GeoWorks for PC). 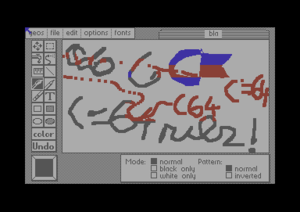 Released in 1986, it provided a GUI for the C64,128 and Apple II. 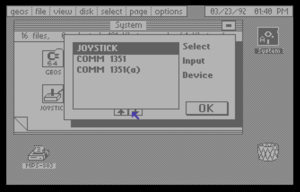 GEOS was handled with mouse or joystick. It utilized a technology called turboDisk to achieve fast access to disk drives. 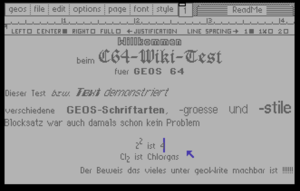 1993 GEOS 64 2.5 in Germany developes M&T with the "GUC - GEOS User Club" together a new GEOS version. Tip: Fast loaders should be deactivated ! By using GEOS with disk drives and floppy disk should be duplicate the system disk for working disk, which contains the DeskTop with a GEOS application and its files and your created applications files. The copy must be follow under GEOS DeskTop, because GEOS has several copy protections! GEOS files (applications, fonts, drivers, etc.) are saved as URL files. The DESK TOP is the graphical surface, from which the GEOS applications are starting by double clicking. The file folder on the desktop list the actual files on disk as icons in a window (only 8 icons on each page). On the upper screen coloumn is a menu which contains the functions of the desk top. On the right side is shown the actual system time and date (set by the user or from an RTC). 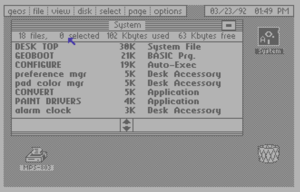 On the desktop border are shown the drives attached to the system (maximum of two 2; with a patch it supports GEOS maximum of 4), the detected printer and the famous trash bin for deleting files. 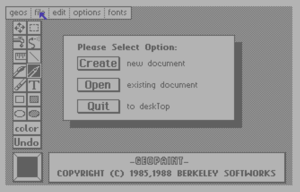 geos: Info about the version of GEOS and DESK TOP, the printer preferences and the input preferences ( C= +I ), also GEOS tools, which can start directly, if it contains on the actually flopy disk. select: Using for selecting pages ( C= +W ) and files in the pages ( C= +X ) or in the border ( C= +Y ). page: Inserts ( C= +S ) or deletes ( C= +T ) pages in the actually desk top folder. options: Leave and quit GEOS to BASIC or reset ( C= +R ) the DESK TOP. Change the system time and date or get an overview of more DESK TOP shortcuts. C= +SHIFT +1 - C= +SHIFT +8 : Select file 1 until 8 on border DESK TOP. GEOS has the main components of a desktop one would expect, geoPaint and geoWrite, and also some tools and ultilies like geoBoot, configure, notepad, geoDex, calculator and drivers for input and output devices. 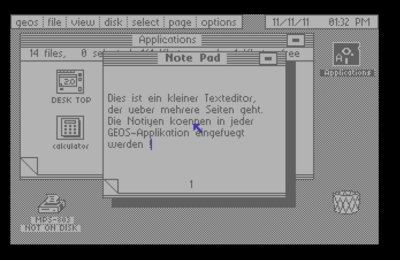 GEOS works similiar to Windows, but it is not capable of multitasking, i.e. GEOS can only run one application at a time. The menu functions can accessed by clicking them with a mouse or joystick, or by using keyboard shortcuts. 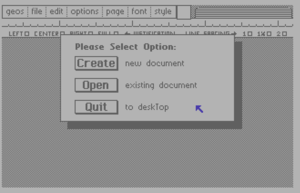 Not every GEOS application used the same keyboard shortcuts. GEOS copies, cuts or scraps can be used in other GEOS applications. For example a text scrap from GeoWrite can be pasted in GeoPaint and a photo scrap from GeoPaint can be pasted into GeoWrite. Today this is a basic principle of Graphical User Interfaces. 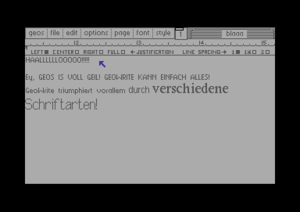 The default fonts are BSW, California, Commodore, Cory, Dwinelle, Roma, University, LW_Roma, LW_Cal, LW_Greek and LW_Barrows, which are used by the GEOS applications. Other fonts can buy. The pixel fonts have defined font sizes. Not every font has all font sizes available. The maximum number of shown fonts in applications is seven. 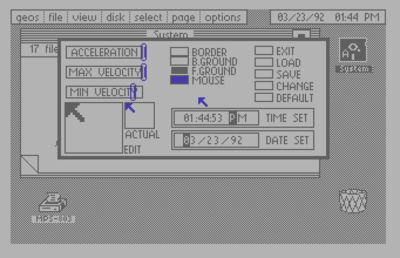 By loading an application with a nearly full floppy disk, an error message will appear and the application will not start. When a GEOS application first loads a dialog window appears in which you choose to create a new file, open an existing file or close the application (return to DeskTop). Not all GEOS documents (files) of GEOS applications can open directly over the DeskTop. This works e.g. with GeoWrite documents. 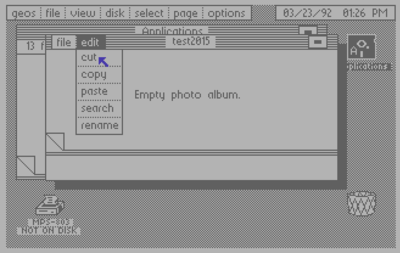 A painting program with a photo manager. 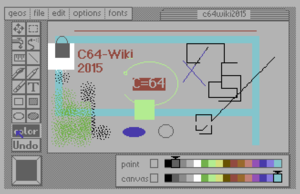 It works similair like modern picture editors, but it used only 16 colors. Brush: Paints with selected brush type and color. Also offers different painting modes normal, only black, only white and pattern (normal, inverse). Pencil: Paints one pixel at a time. Rectangle: Create rectangle with selected color. Full Rectangle: Create fully rectangle with selected color or pattern. Ellipse: Create ellipse or circle with selected color. Full Ellipse: Create fully ellipse or circle with selected color or pattern. Color selection: Choose one of 16 colors for painting and for canvas. file: Manages the GeoWrite files close, update (save), preview (for printing in WYSIWYG), recover, rename, print, quit (and save) to DESK TOP. edit: By active tool selection can the selected aera cut, copy or paste. change brush: Choice one of 32 brushes for the tool brush. color on/off: turns on the s/w-mode or the 16 color mode. draw grid lines: 80*80 pixel grid appears. Should be not used! erase grid lines: Deletes the 80*80 pixel grid. Attention: The pixel on the grid lines also deleted! fonts: Choose one of 7 fonts in a define font size. A word processing program with a wysiwyg mode (what you see, is that you get), a text manager and different font styles like plain, bold, italic, outline, underlined, superscript and subscript. The screen used the WYSIWYG mode. If a text select and paste is used, so will be overwrite the marked text ! More pictures of GEOS applications and tools. GEOS 128 2.0 [dead link] <- IMPORTANT: Only using with the tool on this website[dead link] !!! 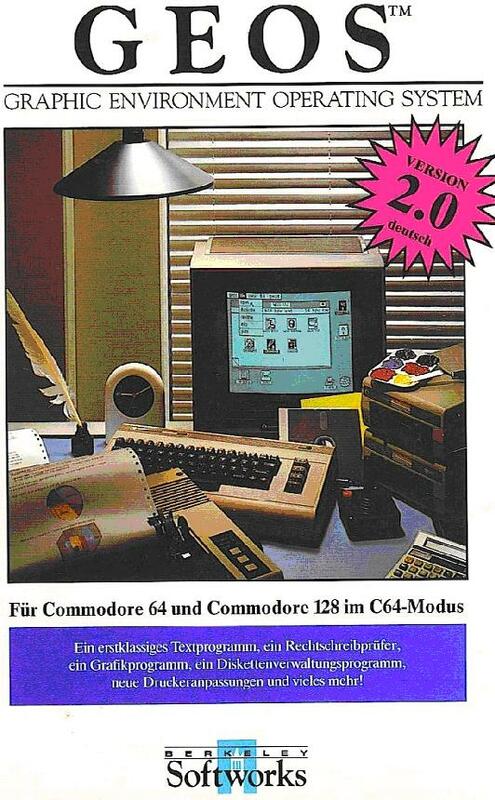 This article in the German C64-Wiki "www.C64-Wiki.de" was "article of the month" in July 2005 and "article of the year" 2005. This page was last modified on 26 October 2018, at 02:32.